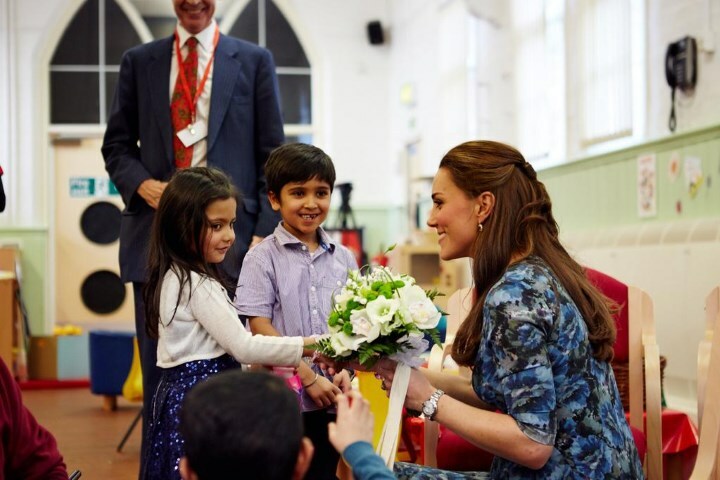 The Duchess of Cambridge carried out two engagements in Stoke-on-Trent and Smethwick today. 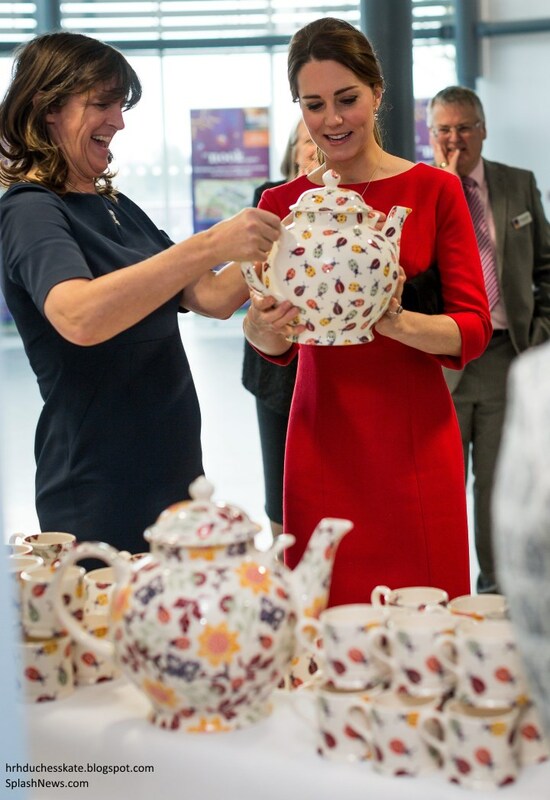 In her role as patron of East Anglia's Children's Hospices, the Duchess began the day with a visit to the Emma Bridgewater factory to learn more about a special pottery project which will help to raise vital funds and awareness for the EACH Nook appeal. Due to the high demands of the charity's specialist services in Norfolk, the team has outgrown their current hospice in Quidenham, a very old two-storey building. Accessibility and flexibility within the building is restricted and there isn't scope to expand. 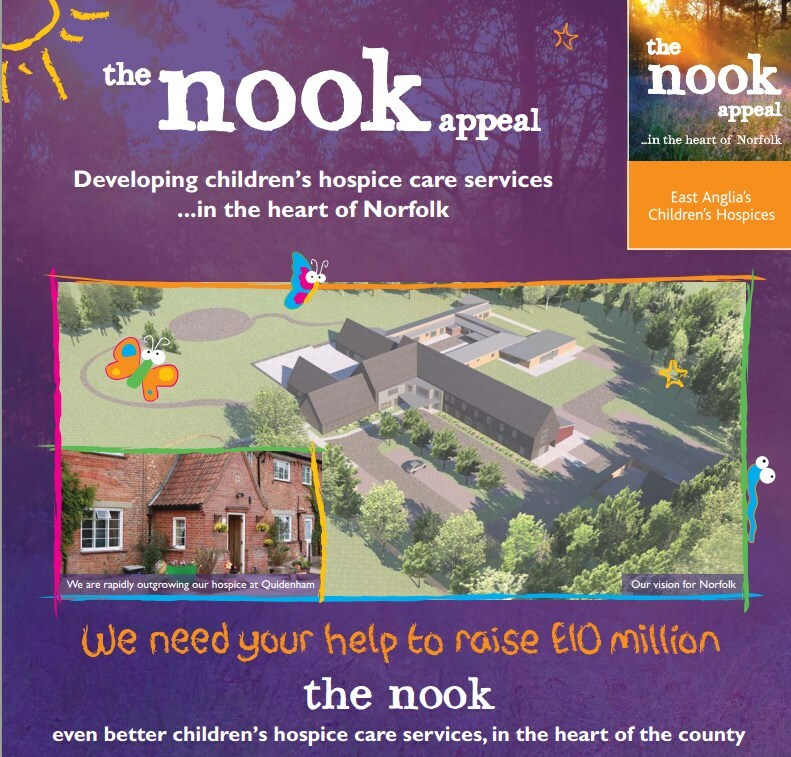 EACH has obtained planning permission for a new hospice - the Nook - but needs to raise £10 million to make this dream a reality. Raising a sum of £10 million is no mean feat, and since the launch over ten weeks ago they have raised over £500,000. It is hoped with increased awareness, the help of their royal patron, and collaborative projects with businesses such as Emma Bridgewater it can be achieved. If you wish to donate to the appeal please click here. The Duchess toured the factory and saw how the traditional earthenware products are made and decorated by using traditional techniques. Emma and her husband Matthew used to live in Norfolk and were delighted to team up with the charity to design mugs titled the 'Insects and Flowers', 'Ladybirds' and 'Ladybirds Baby Mug'. The partnership was encouraged by the Duchess of Cambridge and for those eager to purchase one, they will be available for pre-order from today with £5 from each sale going directly to EACH. Kate was first shown the pottery by Emma in November when she attended the launch of the Nook appeal. Emma Bridgewater began in 1985, after Emma tried and failed to find a birthday present for her mum. "I was looking for a really special cup and saucer, but everything was either too formal or too clunky. That was my eureka moment. I realised there was a gap in the market for pottery that was beautiful and practical – pottery for a relaxed, colourful, mismatched life." For pottery lovers, the website is something of a treasure trove. Stockists include John Lewis and Selfridges. Below we see the pink vase collection. Her Royal Highness then joined families from the Donna Louise Children's Hospice in a ceramic painting workshop. Before unveiling a plaque to commemorate the visit. The plaque unveiled by the Duchess (perhaps the nicest one I've seen). Next, the Duchess visited Action for Children's Cape Hill Children's Centre. Kate received an introduction to the charity and its work in providing early support for vulnerable families across the UK from staff and volunteers. 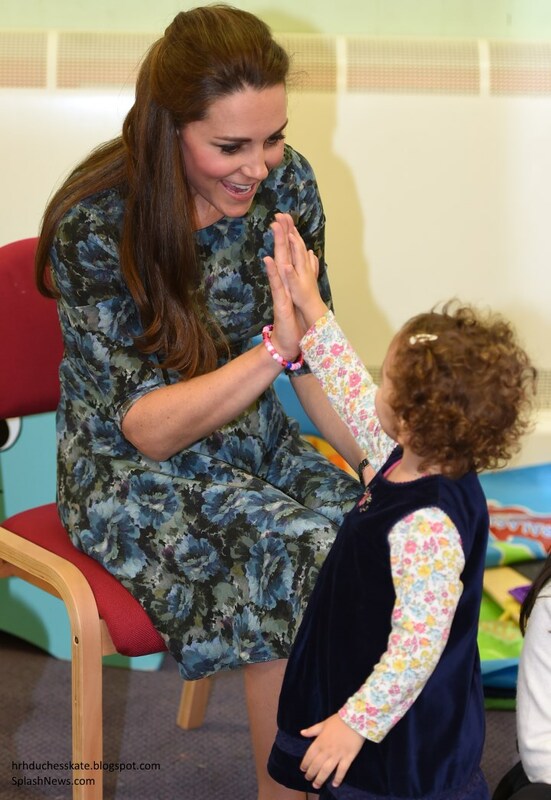 The Duchess of Cambridge then attended a private roundtable discussion with families who have accessed Action for Children services including the organisation's Sandwell Family Partners programme, which is based at the centre. 'Michelle Griffiths, 33, from Smethwick, told Kate how she has "died" six times and then been brought back from the dead after suffering heart attacks. Her daughter, Chloe, 13, is her main carer and her son, Alfie, 4, has had to be taught to call 999 if she suffers a heart attack. "I was telling her that sometimes I feel like I have stolen my daughter's childhood but she doesn¹t see it like that," Michelle said. It was all too much for the 33-year-old Duchess, who has become an ardent advocate of early intervention to help children suffering with emotional difficulties because of challenging family circumstances. "You've brought a tear to my eye," said Kate. 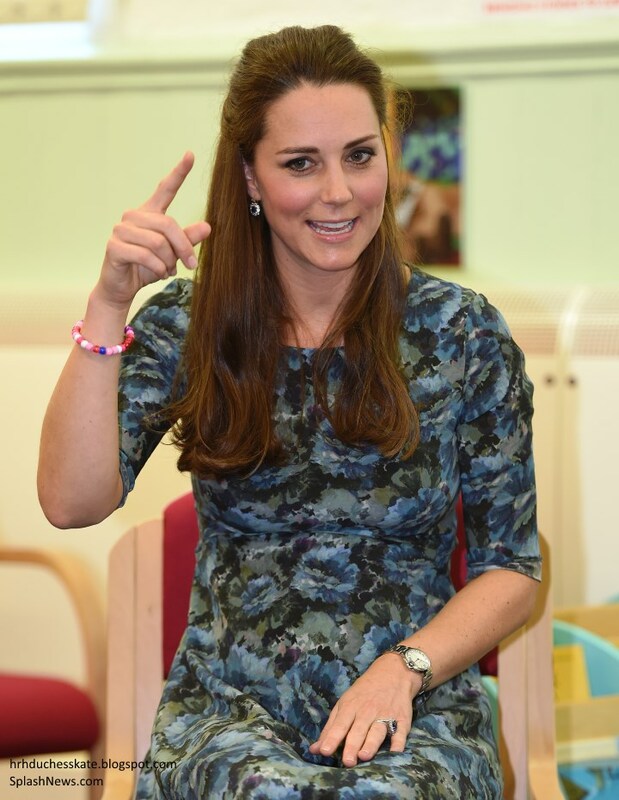 A youngster made a pink beaded bracelet for the Duchess. Her Royal Highness also watched a play session and meet the children and parents who use Cape Hill Children’s Centre. She said "I should have brought George. He would have loved this". 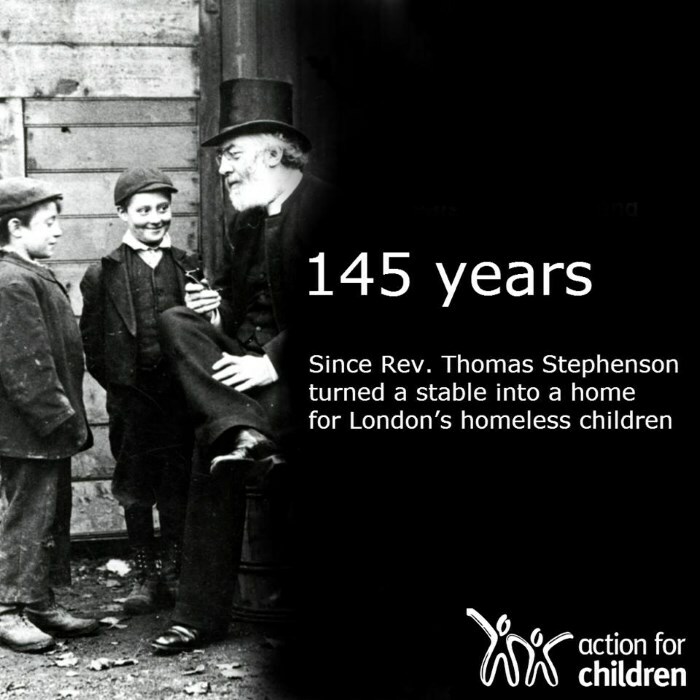 Founded in 1869 by Methodist minister, Reverend Thomas Bowman Stephenson (the charity recently celebrated their 145th birthday), Action for Children is a national charity that supports and speaks out for the most vulnerable and neglected children and young people. It works with more than 300,000 children, young people, parents and carers each year at 650 services based in the heart of communities across the UK. The organisation would make a great future patronage for Kate and would be very much in keeping with her desire to work with young people. 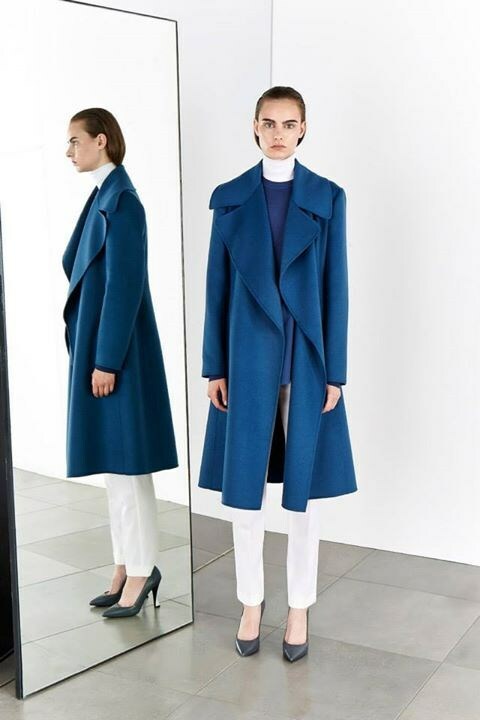 The Palace confirmed Kate's blue coat is by Max Mara. Following much searching, the wonderful ladies at Kate Middleton Style discovered the garment is from the 2014 SportMax Collection. The style name is Gerbera; and while it's not identical, it's the closest piece to Kate's. Ashley Marie called the brand and discovered the piece originally retailed for $2,490 and came with a belt. Underneath, Kate wore her Seraphine 'Florrie' Floral Printed Dress. The £99 dress comes in "stunning marine ocean shades" and is made in soft woven fabric. Both the coat and dress are part of the brand's Spring/Summer 2015 Collection. Readers will remember Kate debuted the dress for a day of engagements in Kensington last month. 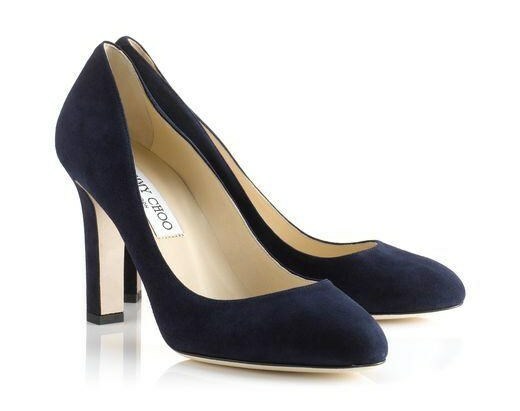 The Duchess wore her navy suede Jimmy Choo 'Georgia' pumps. 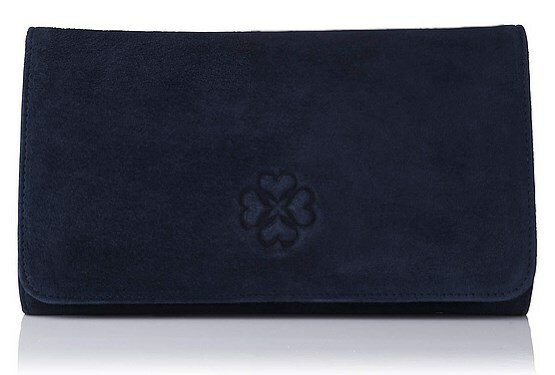 It appears Kate carried her matching navy suede L.K. Bennett Frome clutch. 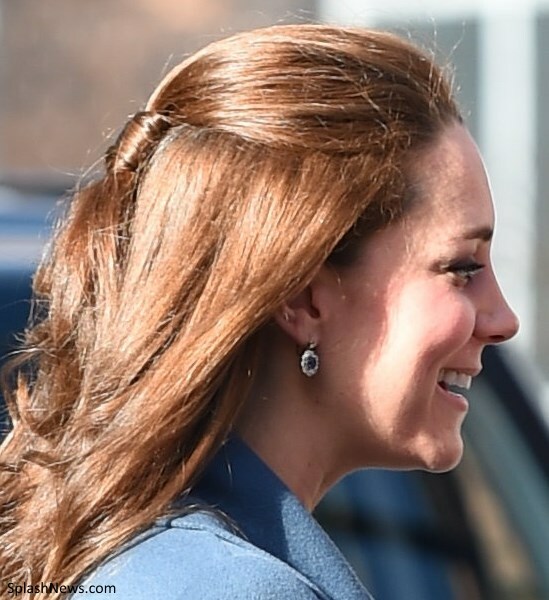 Kate accessorised with her sapphire and diamond earrings. A look at Kate's hair today. It was worn partially up and as you can see from the shot below it's looking particularly long at the moment. You can watch videos from the day at ITN Source and the Kensington Palace Twitter Feed. I love the colour of the coat, the coat itself is nothing special. Her hair looks great, it is good to see her changing it up a little bit. As I adore every kind of pottery, it must have been really exciting to visit the place. Wedgwood blue for a visit to the potteries. Lovely colour and particularly like the seaming down the back. The mugs are very pretty---hope they raise a lot of money for the hospice. The Action for Children seems like a possible patronage for Catherine. looks so red in the sunlight. @ Erika. She might be using henna instead of hair dye during her pregnancy. I think you are probably right Philly. I like that she chooses pieces that are not high profile and flashy or overly stylish! Her style reflects that of a woman who prefers to be viewed as a down-to-earth people person and mother; and I'm sure people feel more comfortable in her presence when she wears clothes that are more "normal" - especially on occasions like this where she is around children and families with hardships - the last thing you want to do is appear snobbish and unapproachable. I like that she keeps it simple for certain occasions to bring more attention to the charity she is supporting and not "what she's wearing". She does have those WOW moments for the galas and fancy dinners. Give her more credit. I really like the coat ! The dress maybe one of my favorite pregnancy dress she wore ! This is a beautiful garment, but comes across as nothing special due to a lack of STYLING. Accessories are glaringly absent. What a difference a pretty scarf would make, or a good sized broach on the lapel. Also disappointed in the tired,overused suede pumps. I just think that if you are one of the most photographed women in the world, you would avail yourself of a good stylist. She might have somebody who is sourcing her clothes and obtaining them for her, but not doing a very good job of putting together a cohesive outfit that photographs well. And one doesn't even need a stylist to grab a scarf and wrap it around, or pin a broach to a lapel. Hmmm. Interesting how different our views can be. When accessorizing I'm from the Less is More school. A scarf with that print dress and bling wouldn't do it for me. I loved the simplicity and cleanness of the whole look. As for shoes, look to the surface where she is walking. I'm sure she didn't step out of the car with dust on her shoes; that likely came from walking. Maybe she likes it like that, don't you think? I can appreciate Kate's down to earth style, but her outfits are just so bland and boring. The same dull shoes, clutches, blue coats - it's just deathly dull and not very stylish. It's all so British bland - A scarf or broach, would have done wonders for this outfit. Sophie and Camilla, to me, both look fantastic when they go out - smart and well put together. Kate is a Duchess - people don't want to see ordinary - this is where Diana really knew what she was doing. I've said this before, but Kate is desperately in need of a stylist - someone who can pull an ordinary outfit and make it look amazing. While today's coat was nice, and looked better than the cream one last week, a maternity coat would be much more flattering on her. And get a new pair of shoes that are actually for a 33 year old women - not a 50 year old women. I'm much more into watching Mary's style - she always looks professional, but extremely stylish and put together. Lack of styling?? Geez Louise. I'm speechless. I thought she looked fantastic. And her warmth and sincerity shine much brighter than all the brooches a stylist could add to the mix. Hehehe, oh dear ladies ! The various opinions.....hope Kate stays true to herself! Kate us a duchess. Not Sarah Jessica Parker. Classic is what suits a duchess, if this the argument you're going with. Oh my, Melissa, speaking as a (more or less) 50 yr old woman, I'm pretty sure those Jimmy Choos are not meant for me! So interesting how differently people see the world. Melissa, diana paid a heavy price for style...im not saying that style had everything to do with what happened to her but it sure is somewhat to blame. Kate is not diana, sophie and soooo thankfully not camilla. kate is for certain a tad predictable...but there are worse things im sure. She has gained weight and looks fabulous with the exception of her hairstyle...but she does have gorgeous hair regardless. I'm with Barbara on this one. It's just...dull. The blue is really, really pretty. The dress, we just saw her wear. A little something extra would have really added to this look. Her hair looks pretty, though. And, umm, sorry Kate...but wearing the coat while working on pottery looks pretty ridiculous. Should have tken the coat off. Diana was in a different position and at a time when "the more the better" was the approach to fashion. And, in my humble opinion, once she realized she didn't have the support of her husband and in-laws, and she couldn't do anything right in their eyes, she took on a "heck with them" attitude and enjoyed the parts of her role that she *did* have control over. This is Kate's style, and we just have to accept it. She likes "less is more" and simple clean lines that do not draw attention away from the charity or whatever she is promoting. She is not Diana; she is a Middleton woman whose style may develop more along the lines of her mother's. Quite frankly, I like this look today, and I don't mean to offend anyone, but in my opinion brooches are for older women like Camilla, not for a thirty three year old duchess. Her "official" appearance may be too plain for many of us, but that's the look she prefers to project, and we have to respect it. Personally, I would love to see her wear beautifully tailored pants when the occasion is appropriate or more glamorous or classic shoes with peep toes or t-straps; however, I realize that Kate takes very little fashion risks and has a safe, standard look that has become her classic style and which I've learnt to accept. I think this may be her way of coping with the kind of scrutiny she lives with everyday and also her not wanting to be seen as a Diana-like fashion icon that people want her to be. Maybe in time her style will evolve into something more sophisticated or exciting, but I'm not counting on it. In the meantime, I still admire and accept her as she continues to develop not only her own brand but also her own personae for the different roles she has to play in this high profile position she's married into. So Kate may be somewhat predictable in her fashion choices, but I think she'll grow in other ways, will stay the course and will eventually be a stabilizing force in the royal household. Anon at 9:22 - I second the hope to see Kate wear pants. I hate that she wears dresses to everything that isn't a sporting event (and sometimes even to those). Nicely tailored pants with a classic top are just so professional. I think there is a good and important balance of looking both princess-like, very tasteful but a little fancier than most people wear, and the work princesses do. Diana had many problems but she did have the knack for looking wonderful and still being mostly known for her work. I think this is something Kate is still struggling with a bit. Before her marriage and during the first year, she looked very stylish. As her engagements slacked, her look became more casual as if she is trying to compensate - see, I'm just a normal mum. I don't think it's lack of interest in clothes -she has always shown lots of interest - I think it is a fear that was all she is known for, and in a sense it is, because she hasn't yet sharply defined her role. She has shown steps in that direction this month with a couple of engagements but in the future, she will be needing to do a lot more. At that time, I think she may return to the more fashion conscious Kate we first saw. Even the queen has her own style. This was certainly a simple look but a lovely colour on her for this engagement. The length is also very flattering. It has been very enjoyable to see her at work. Hope there are a couple of more engagements before the baby. Or maybe she just doesn't like those things you'd like to see her wearing. And she wants to be a duchess in a skirt, and not look like a businesswoman in pants. Letizia of Spain wears slacks when appropriate and I don't see anyone saying she looks like a businesswoman, and if they did I don't see how looking like a career woman is a bad thing. That could be read as a dig at businesswomen, Camilla. Camilla, only business women wear pants? What about the Queen of Spain. She wears tailored pants all the time and always looks quite regal. I think Kate could do the same. She has the right figure for it. But I don't think it is fair saying only business women wear pants. I think Kate likes dresses and there is nothing wrong with that, however, I agree that some of the appearance she makes would be better in pants (such as bending down to small children). Royalfan you made me curious so I looked for Carol in dress pants and saw none. That is not to say that she has not worn them, rather she may not have been photographed in them. But you actually made an interesting point. That may be why Kate prefers dresses. If Carol always veered toward dresses, her daughters may have grown up with the same preference. Kate has great legs, so I can't blame her for always wanting to show them off. I always feel more like a lady with a bit of sexiness when I wear dresses and high heels :). I just selfishly would love to see her in pants sometime. Like Letizia, I think Kate would look amazing! I'm talking about traditional wear. Traditionally, royal women wear dresses. At least in the UK. Trouser suits traditionally are in the realm of business. I just think Kate goes with symbolic and traditional-classic clothes. Absolutely not a dig at businesswomen! I'm sorry if it sounded like that. I meant, if I think trouser suit, I think businesswoman, not duchess. Letizia of Spain is very elegant, and evidently has different tastes-ideas about clothes than Kate. Also, let us all remember... not everyone likes-feels comfortable in trouser suits. Yeah I can't remember ever seeing Kate, Carole, or even Pippa in dress pants (although Pippa is the only one we would ever see in dress pants since Kate and Carole (mostly) have only had jobs with Party Pieces, so harder to get pictures from that). Camilla - there's absolutely nothing with "looking like a businesswoman," and also, I'm not sure why wearing pants makes anyone automatically look like a businesswoman, except for sexist ideals of what people in business wear, versus a "duchess." Pants look professional, classy, and regal. I think they are perfect if she really does not want to be considered a clothes horse anymore. People get a lot less excited about nice dress pants and a shirt, even though I don't get that. And, sometimes I just feel like Kate's outfits are a bit little girl-y, and could use a little more sophistication. If she doesn't want to be known for her clothes and wants to focus on the engagement at hand, then she should adopt the business-style dress that most women wear (obviously with some differences). Norah O'Donnell, a television personality, here in the states was wearing the LK Bennet poppy dress this morning in pink. Just seeing it in pictures on a computer screen doesn't do it justice. It is a beautiful dress. Kare looked lovely and well. i love the way she covers her bump. it will take an untrained eyes to really make sure that she's pregnant. she's lucky she's tall cos her bump looks small. She really does have fabulous legs. Yes, she does bluharre, and THANK YOU for your positive comment. I think her overall look was great! not yet, blue27! Give me time. Deal:))I am happy you are back either way. bluhare, indeed she does have lovely legs! Beautiful cause, beautiful pottery and beautiful day. On the style front though, I don't like the coat's fit. It is again a coat in a larger size. 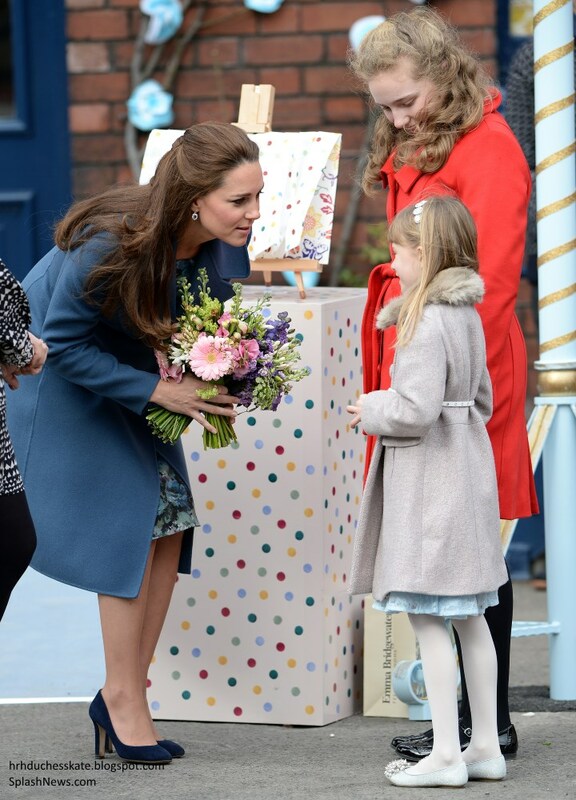 The powder blue coat Kate wore the other day was maternity style. It was soft and fitted so beautifully. Being pregnant is a stunning thing and so many of us have to make do with what we can find to fit but she is a princess who can dress the part. She can showcase and wear and be beautiful in true maternity wear. Why try to hide it or just do with larger size clothes that don't fit that well? Kate always looks good but still, in comparison with the true maternity clothing she had been wearing, this one does not match up. I don't see how the coat is too large? I agree Ali. Since they haven't found an exact match to this coat it is very probable that it's bespoke, so ofc they make it a maternity coat then by default. Because that's her measurements at the moment. It looks like a maternity coat to me. The fit on the shoulders is good; if you look at the similar coat on the model, the shoulder seam falls at the exact same point. Considering that the front closure goes down in a straight vertical line over her bump, and the hem is even all around, I'd say it has to be maternity, or bespoke -- which as Rebecca points out, would be the same thing in this case. I agree that it looks like it was made for her at this point. If you look at the photo taken from the back it looks very tailored and a great fit. Hemline is perfectly straight. Arms are the only thing that look at all big and can't say that my own coats don't have the same look. It's hard to move your arms if too tight !! I would order some pottery. Do you think they ship to the USA? 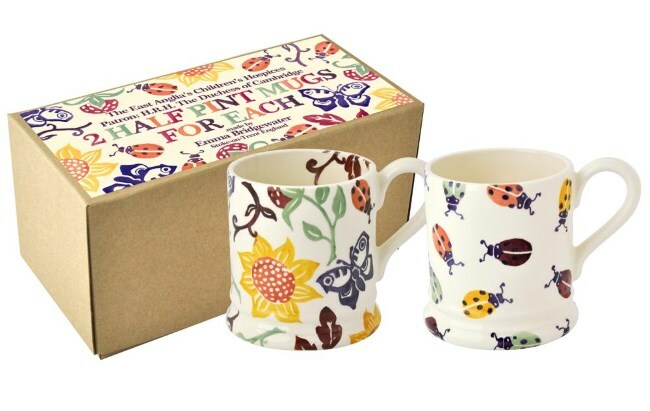 Emma Bridgewater USA ships for internal prices. I just ordered a Starry Nights plate for Fourth of July (it's backordered, which is fine given the date), The little pink hearts vase (far left in Charlotte's photo) is on my table with a few flowers from Valentine's Day. I like the hearts on Kate's clutch, by the way. Nice touch. I absolutely love this coat (although I really can't understand why Kate usually leaves her coat on when she's indoors). The color is gorgeous! Personally, I like this coat better than the powder blue one she wore last month. I think Kate looked beautiful today. Everything--from her hair to her accessories to her jewelry--was perfect! I'm also wondering if because she typically moves around a lot--in and out of doors--during a single engagement, it doesn't feel natural to take her coat off. For example, notice how she removed her coat during the second engagement when she sat down for the round table discussion. As you and others have said, though, it is probably because she is more comfortable, temperature wise, with it on. I know I tend to leave my coat on for a while when I go places. Actually I believe this is accurate. It's the one and only piece of info I've ever gotten from someone who actually met some of William and Harry's set a few times. Kate runs cold and that's really why she loves the coat dresses. Not as much of a problem during pregnancy, probably. How did the person that you know meet people in the royal circle? That's pretty cool! Here's a theory - she's started removing coats for the 2nd engagement so the pictures look different from the first one. Otherwise, there would be no reason to keep showing photos of Kate looking the exact same. It's a PR strategy designed to give each visit it's own press. She was living in London and she was (briefly) dating a guy... it didn't last. Meeting and sitting with children is not the same as touring a factory. And, with or without her coat on, she'd be a tad overdressed for working with pottery. PR is not the answer, but we see a change in the way things are done already, so it's fun to speculate. A small thing like looking different gives the impression of 2 different engagements instantly. It can be that it has nothing to do with PR, it probably doesn't. But stuff like that is exactly what a good PR person can accomplish. She painted pottery with her coat on at the Bridgewater Factory with children. She took it off at the Center when engaging with a different set of children. It gave each event it's own look... otherwise you wouldn't be able to tell one event from another. Yes, it is a PR strategy that began in 2015 when the new fella started. It's also a smart one. She did the same thing in Kensington. I know you find no flaws with Kate - but there are things that she could be doing to improve her press appearances. The newly released video is another example of improvement - it wasn't just two minutes of staring at Kate sitting in a chair - it spliced into it pictures of Kate being active with children, supporting the organization, and there were both close ups and long shots in the video. This is a person who plays sports in high heels, paints murals in white coats, wears short skirts to bend over to talk to kids and you think she'd dress properly for pottery throwing and decorating? Lets not turn kate into a child flasher...her skirts are a fine length for someone of her age. I do find some faults with the duchess and she is by no means perfect, but that comment was in extremely bad taste...imo. Its in bad taste to wear short skirts when you have to bend down to get eye level with children - my pointing it out is not the problem. She sat down THIRTY SECONDS to paint. And her skirt is not too short. The amount of spite you put in your comments is worrying. Even your constantly remarking how everyone else finds Kate 'immaculate' and with 'no faults'. Don't worry: we consider Kate a flawed human like everyone else. What we discuss here are particular choices, charities, pottery, dresses, hairstyles, colours, and other things that are not Kate The Person. We have no right - and no information, for that matter - to speak about Kate as a person. If you think it that way, you'll feel more relaxed. Kate is a public figure representing a family and a country. *I* discuss how that image is being represented in the media and how that image can be interpreted. YOU might discuss her attire and whether it looks good on her and whether you might wear the same. *I* discuss whether she is dressed properly for the audience and the occasion. YOU might see someone who does charity work - *I* see someone who visits charities to see other's work. YOU might see spite in my comments - *I* have never used the word "immaculate" and therefore cannot have constantly used it. You might worry more about you seeing things that are not there. I have every right to speak my thoughts on any subject I wish as does everyone else on this board. It's a discussion board - not a pep rally. I'm perfectly relaxed with my thinking processes - so no thanks for the "thought control" advice. Finally, royalfan and I have a friendly debating history, offering points and counterpoints on the board - we've never attacked each other personally for our differing views as you are doing. Camilla, you are so right. Kate isn't perfect; she's a human being. And following Kate isn't about being a worshipping "sycophant", but a spirit of goodwill would be wonderful. At the end of the day, it's nice to enjoy (one can hope) some downtime in a world that has more problems than we will see resolved in our lifetimes. Obviously, no one has to love everything Kate does, wears, thinks, or eats, but someone please tell me what the motivation is if one is *consistently* unimpressed with her and puts her down. If that is enjoyable, then I echo Camilla's "worrying" observation. Camilla, Moxie mentioned her opinion of Kate's clothes, something that is discussed everywhere here. 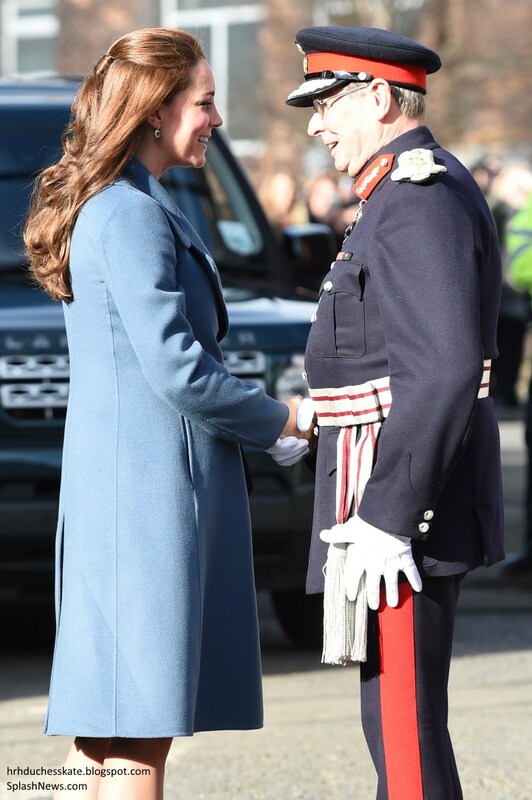 She talked about her thinking on why Kate removed her coat,and (heaven forbid) interjected an opinion about Kate's hemline when she has to bend down and greet children. It doesn't happen to agree with yours. So what? You have a scroll down key; it comes in handy. There is a string about her hair color and what she does there, full of speculation. Every time Kate visits a charity there are a lot of comments about how much Kate cares and how great she is with children (yet she could only paint with them for THIRTY SECONDS (emphasis yours)?). There have been conversations about what she does at home, who she talks to, what the nanny does, etc. etc. etc. There have also been lots of threads speculating on other people, and not in a great way, and those threads most definitely touched on them as people. I don't understand why you would tell someone else not to talk about their take on Kate when you do it (which you have if you've ever voiced an opinion as to why Kate did something) and didn't say something to others when they were doing this to someone else. If we did not have the "right" to talk about Kate there would be no blog, and if you'd like me to point out examples of when loyal fans veer into personal territory I'm happy to do so. You can't have it both ways. royalfan, I will tell you that you read less positive comments from me here because by the time I get here normally it's been said many times. Maybe people need to think about that. Do you want yet another "Kate looks lovely" comment? Do I have to agree with someone to get commenting cred points? When I have something positive to say that hasn't already been said, I say it. So does Moxie for that matter. So do most of us who people think should shut up and go home. Matter of fact, I've seen people who do say something nice get it for doing just that. I have seen some really hurtful comments slung at other posters by people who didn't like what they had to say, so much so they left. I have had things said to me that made my mouth drop open. And by people who think we should just be positive. Really, sometimes we just can't win with some of the people here. Damned if we do and damned if we don't. bluhare, unkind remarks have been made on both sides and it's unfortunate. And no, I do not expect or want to read 500+ "Kate looks lovely" comments, but I admit to becoming increasingly frustrated by some of the more persistent negativity. I find it depressing and, as I stated before, I just don't understand the motivation or satisfaction behind it (and so far no one has addressed this head-scratcher). Since Kate has not worn a too short skirt lately, is not playing sports since she is pregnant, and can obviously add a bit of paint to a mural or toss some clay quite neatly, the basis of this conversation is rather moot. What bothers me most are strings of accusations that are not especially accurate and certainly not kind. Kate's recent engagements have been very interesting and very well handled on her part. Dredging up old criticisms or criticizing her for something she did well recently makes it sound as though criticism is the writer's main focus and motive. I don't see the point of such a focus. I don't think anyone is satisfied when they find someone's performance lacking, royalfan, and that's what I see when I read those comments. It's not because people love to rile people up (although there's one in every crowd, I'll give you that); I detect a lot of disappointment in those comments. And when someone said that perhaps her expectations of Kate were too high and if she lowered them she'd be happier with what Kate does and less negative, she got scorned for it. That's exactly what happened with me too. I had stars in my eyes when Kate married William and got really disillusioned. I wish she would do more, but I helps that I don't really expect her to. If that makes me a horrible person deserving of ridicule and derision, so be it. Don't know if that eases your head scratching, but that's my take on it. Bluhare, I wasn't discussing opinions. I was discussing negativity. Moxie puts such an energy in being negative, and such sarcasm, and suffers so much from the idea that Kate can be considered perfect, that I told her nobody is saying Kate is, in the hope she will find peace. And I'm saying so as someone who used to behave exactly like her. I know the feeling of discomfort that's behind that constant negativity. Hi B. and R.: it's a very good idea, only new, very original comments - never written before - are admitted from now on. I'm afraid the number of posts will dramatically decrease… and maybe some tasteful pun or other funny things will be missed… and I will have poor opportunity to improve my English. Please, B., go on with your fabulous moaning - and please, R., go on being the most kind and lovely poster in the world! She is perfection. I love her she is really sweet. Said this earlier but this fits as well as any maternity pieces I have seen. I like her hair today and I love her dress, even if it is a repeat. I almost cannot believe she is 7 months pregnant, she looks amazing! Loved this look! So happy she took her coat off inside to show off that pretty dress and glad that she pulled her hair half-up as well. Great look for Kate! It appears that panels have been placed along the sides to accommodate the coat for maternity wear. I so love the dress. It's just lovely. Clever styling of hair to hide the regrowth we saw a couple of days ago. I've been laid up recovering of late & came across some Documentary Series that I watched about The Royal Family. That said, it couldn't help but put a New Lense on how I look at our current days. After watching So Much footage of Diana, I was struck by some things I never really previously noticed. I even stumbled upon a Docu-Series Comparing 1/2 screens of Diana & Kate together for comparison! a) I was struck by the difference in their "Carriage", DI always played that cat & mouse game with The Press, while I see Kate as a Calmly Confident Woman, Honestly learning as she goes, endearing but not coy. b) Their Styles were strikingly similar at times (seeing these split screen photos of DI & Kate wearing the same colortype outfits & I Have to Say..... Kate Wears it Better Hands Down & This is Why..... (Remember these are new lenses & perspectives for me).... DI came off either way too coy or trying too hard, I thought. Kate on the other hand whether in jeans & a cowboy hat at Polo or in formal or professional attire just exudes a certain genuine calm, as if saying She's very aware & puts genuine care into her fashion choices, but She's not at all interested in playing games & doesn't mind downplaying things to take the limelight off herself, while I strangely realize now in a new way, that DI was pretty much all about DI when it came to fashion & just being photographed. Finally I was So Amazingly Struck with the Vivid Memories of How Hard Diana Worked to Raise, Teach, & Prepare William (with Such Amazing Wisdom on Her Part) for the Real World, Even The Most Unpleasant but Important Aspects of it! She did Such an Amazing Job just Breaking Down Barriers right & left, like a bull in a china shop & Rocking The Royal Firm:) Nothing was going to stop her from Preparing William to Be King when the time came! When I looked back & reflected on her legacy, sure she brought Style & Pizzaz to The Monarchy, but Her two Most Important Jobs, that became what I believe are Her Greatest Legacies.... are that First, She brought Humanity & Compassion to the process of being a Royal Patron of Charitable Organizations! Where before it was all stiff & proper, with Diana it was about Really listening & a Hug! :) Of Course Her Most Important Job & Legacy of All was the Raising of William & Harry! They would Not be the Incredible Men They are Today, Without The Love & Teaching (in word & deed) of Their Mother! Very beautifully written. I think Kate's biggest strength is how comfortable she is. She has true self confidence. That doesn't mean she can't get nervous, but she exudes a calmness that is so beautiful! Well stated and I agree with you 100%...Diana would be so proud of her sons and I think she and Kate would get along very well. I must say that I am always impressed with Kate's confidence, calmness and overall genuine nature. Her genuine nature is what we all love about her and her willingness to roll up her sleeves and get the job done. Thank you for your post...I enjoyed it. Well said Becca. My thoughts exactly. Princess Diana would have been so pleased that her son and grandson and the coming grandchild are living the life she envisioned for them. I think Kate looked perfect today. Well done. Thank you Charlotte. You are very fast with these posts. We are enduring a deep freeze here and I am so looking forward to summer. I dont even care about spring at this time. Have a great day all. Becca I say AMEN to what you wrote. You can see the love Kate has for William by just the way she looks at him. And I truely believe he loves her just as much. May they have a happy and long life together with as many babies as god will bless them with. I think that a great merit for Kate's attitude towards life goes to Kate's parents, Carole for sure but also, very much, to Michael Middleton. He is a so nice person, sweet and calm, he gives me a feeling of wellness. They are a great couple, a perfect model for Kate. She learned so naturally how to build a strong link with her husband and how to make a home a really sweet home. 2) About this pink coat Kate wore for ground zero, Camilla wore a similar shade on her visit to the ground zero, and the Queen wore a blue floral print. I know it's late to state it, but I was busy the last few months and didn't have time to post a comment. Just thought it was really interesting facts. Debby - I think there are a lot of reasons to not compare Kate and Diana, but your statistic seems to misrepresent things. For example, in 1983, during Diana's second year, when Diana had a toddler and was pregnant with a second baby, she did 110 appearances (the equivalent to Kate's highest total which was for a year when Kate was neither pregnant nor had a child, and racked up most of her appearances watching the Olympics). Diana also had 170 public engagements in her first full year after marriage. Like I said, I don't think the two ladies should be compared. But if we're going to do it, let's not downplay the incredible amount of work Princess Diana put in. Diana was pregnant with Harry in 1984 so a lot of that year was taken up with the baby - but she did a whole lot more that year according to my books than Kate has - it may be the way engagements are being counted. Just looking at the lists and pictures in some of the books on Diana shows the difference. Can we also point out how much younger Diana was than Kate? Diana had a short engagement and was thrown in. Kate dated William for a looooong time and had time to easy into her role. The age difference also makes a huge difference. I really don't think Diana and Kate can or should be compared. Maggie and anon from Leominster, good points. Wasn't aware of it. Of course, I wasn't trying to downplay the absolutely amazing and wonderful work Princess Diana did. You have to also remember Diana was married to the next in line. Kate is not. It makes a big different. Also I think (my own opinion) that William like"s her being a mother and a housewife. And doing just a few engagements a month. But who knows for sure. Anon at 1:59 - If Kate wants to be a mother and housewife, good for her. But it's not William's decision to make or even prefer. Great look, and I love the blue coat! Hair, by the way, grows like weeds during pregnancy - it's all those hormones. It also gets lush and thick, and then thins out after childbirth. Here's a nice video; I love Kate throwing the clay! The blue coat is beautiful on Kate, and fits very well. It does appear to be unlined double faced wool, which show creases from sitting. I like her look, including the hair style. Not a fan of this look in general. And it baffles me why she's wearing maternity dresses but not maternity coats. You can get away (most of the time) with non-maternity wear in the first trimester and even into the second but at post-six months, she really ought to be choosing maternity wear. It's cut to fit a pregnant body vs. buying bigger-size non-maternity wear, which isn't cut or sewn to hang over and around a pregnant belly. I like the color of this coat but the cut is voluminous and kind of shapeless. Even post-pregnancy it's going to look huge on her. I get that some expectant moms don't have the financial means to invest in a maternity wardrobe but Kate does - and then some. If she's going to buy this bespoke Max Mara coat, one would think she'd go ahead and purchase a couple of good, lighter-colored maternity coats for the few engagements between now and her "maternity leave." That picture of the Seraphine model and the exagerrated pose makes me laugh every time. Someone needs to show that girl how pregnant women actually stand and walk. Looking at this photo too, especially her face, she looks much, much closer to being due in early April than late April. Glad to see she pulled her hair back. Interesting news - and another big fat fail on the part of the Palace PR and comms office - today about Prince William. Now, he's due to start his air ambulance pilot job sometime "in the summer" vs. starting in the spring, which was the original announcement. If you read the announcement correctly, he will be starting his job as planned in the spring and will start flying duties in the summer. Kate looked lovely today. I thought the coat was a lovely colour which really suits her and the dress went well with it. I am glad she wore a proper maternity styled dress it looks so much better than an ordinary dress in a larger size although to be fair she looked fine in the shift dress she wore in Portsmouth. It was pleasing that she once again took her coat off for what was an event that was indoors as I feel it makes people feel that she is not in a hurry. Regarding her possibly becoming a Patron of Action for Children I would imagine that that would be unlikely for some while as the Queen has been the Royal Patron of that charity for the last 50 years I wonder whether she asked Kate to make this visit? On their website they mention the many times the Queen has visited or held a reception for the Charity over the past 50 years. On another topic it has been announced that William will now start flying for the Air Ambulance in the Summer not the Spring as originally intended I would imagine that this is probably due to the forthcoming birth of their 2nd child in April and would explain why he has been undertaking all the studying in January and February rather than December which was first indicated. Time has not been so tight. I am disappointed there are no more engagements indicated for Kate. I doubt if she will do any while William is in China which leaves little time before she is likely to officially go on maternity leave especially if the rumours that the baby is due earlier than was first thought. I wonder how early the photographers might start setting up outside the Lindo wing if the rumours are accurate!! I just added a few high-res shots of Kate wearing the dress! Kate was demure and tasteful today. So thankful that she stayed away from the black tights. The color of the coat was lovely and appropriate, the style rather boring. I am remembering how I felt at 7 months pregnant and trying to be charitable. She is a beautiful woman - but at this point she is not a style icon - even if people do rush out to buy some of her selections. I am not sure she wishes to be a style icon either and that is certainly her right. This outfit was nice. The color suited her, the coat fit well despite it technically not being maternity wear (although I do think the bottom half is rather shapeless), and the dress looks great on her. But nice is all it was. I really don't get the point of spending over $2,000 on a coat and spending time making it bespoke, just to make it another simple coat in another simple outfit. If Kate really doesn't want to be seen as a clothes horse and/or wear clothing that takes attention away from the cause, then that's fine, but why spend so much money on a coat AND significantly change said coat, when there are much cheaper coats/outfits that she can just get altered a little bit to fit her? I just don't understand spending all of that money (and attention - in terms of changing the design) on an outfit that is nothing special. In fact, this coat has been changed from the original design to look very similar to that light blue Matthew Williamson coat she wore for that rugby match and factory tour earlier in her pregnancy. The collar is almost exactly the same. Kate can obviously do whatever she wants, and has the money to buy expensive, boring outfits, but it just seems odd to me. She clearly spends a lot of money and time on her clothes, given how expensive a lot of her coats are and how many bespoke items she wears. But all of that money and time just to make it look like she doesn't care? Also interesting to see the news of William delaying the start for his job. Kensington Palace said he will take up his post in the spring, but has training, so will not be flying until summer. However, all the initial reports from when they first announced this job said that the training was DURING the exam period, and any training after would involve flying (just as a copilot, instead of a head pilot). So if he's not flying until the summer, then it seems as though he really IS delaying actually starting work (despite technically "taking up the post" in the spring). I'm starting to get a little frustrated with William. He hasn't been seen in almost two months now, and that was just a walk from church. Sure, he has to study, but he was already supposed to be done with that, and he's had time for a 2-week vacation. At least Kate is new (relatively) to the royal family and has had to deal with two difficult pregnancies. What is William's excuse? So much money was spent on his RAF training, just for him to leave very quickly. Then he took a "transitional year," only to avoid actually transitioning. I don't understand where everyone got their timeline of William from. It was ALWAYS said that he would study up until mid-spring. The only thing that have changed is the flying start being pushed a bit, probably because the tour + baby with it accompanying 2 weeks paternity leave. This so his start at the work isn't disruptive and "hacked in bits". Sounds logical to me. This first training until the spring, was for a civilian pilot's licence and training for a different helicopter. When he first joins the ambulance service I believe he will have to do some paramedic training, therefore will not be flying until the summer---a matter of a few weeks. Regardless of the timing and why I am pleased to see the PR team is providing an update rather than him not fly in the spring and nothing was said. Credibility has to be earned and the PR team is finally getting that and describing private visits and providing updates. As for Kate's due date - I really doubt that she's due in early April. For one thing, if she had been sick and potentially unavailable to attend the poppy appearance, I highly HIGHLY doubt the palace would have told the artist that it was because she was pregnant and had morning sickness. I think they would have just said that she was sick. I think they would have announced the pregnancy if she had actually canceled, but I just can't see them risking it leaking that she was pregnant before it was even settled if she was going to miss the event or not. Additionally, what about those pictures of Kate and William taking the train back from Norfolk? I don't think they would have done that if she had morning sickness, even if it wasn't to HG-levels yet. Any risk of Kate vomiting and I'm pretty sure they would avoid having it happen publicly. My guess is that maybe Kate was just sick and considering not making the poppy viewing, and that's what the palace told the artist, and now he's making inferences based on her pregnancy that she already had morning sickness. I do not believe the palace would say anything to the artist since she was there. She looked good that day too. Now if she did not go then yes maybe they woulod have said something. Must say that when Catherine and William returned from Norfolk by train, I did wonder if she was unwell. Trains have loos--cars don't , much better if you are feeling sick. I thought it was such a cute touch to use the print of the mugs. While we're on the topic, those in the US wishing to purchase them can however there's a shipping fee of $30. Those who subscribe to the newsletter can avail of a 15% discount code. I thought she looked lovely today too! I loved the hair style. And I really like the dress - both the first time and now. It's also lovely that she was so compassionate to the families she was meeting. Charlotte, I just ordered an Emma Bridgewater plate from an outlet in the US. I paid $23.80 for the plate and $5.99 for shipping, total $29.79. Those who would like to purchase in North America should google Emma Bridgewater USA. They will find shops that sell the pottery over here. There is no need to pay the $30 to have it shipped from England unless you have your heart set on a piece that isn't sold here. PS My invoice says shipping is free within the US on orders totaling more that $99. Thank you so much for the info on shipping ladies! I'm just going to point out that if you want to support the charity - you can donate to them directly and skip ordering pottery - this way the charity gets the whole donation and not just $5. Thank you for clarifying, Anon 4:21. :) I was afraid of that....and I have my heart set on the ladybird pattern...I think it's so cheerful. Fantastic, fantastic look for Kate today. 10/10 I am totally loving her maternity style. It seems like there are so many of the children's patronages that Kate is getting involved with: EACH, Donna Louise Children's Hospice, Place2B, the Art Room...... I am having trouble keeping them straight. Do these organizations work together? Would fundraising together be of value to them? Do the services that one offers differ from what another offers? I wonder if they would be more effective if they could unify their resources. Or are there so many of them because they each serve a different geographic region? So impressed with Catherine and her ease when meeting children. She makes them feel comfortable. This quote was lovely to read "The Duchess was so friendly I think she encouraged my daughter to be spontaneous. I didn't expect it. But it's how she felt. She was enjoying the moment. I read every update you write, but have never posted a comment. 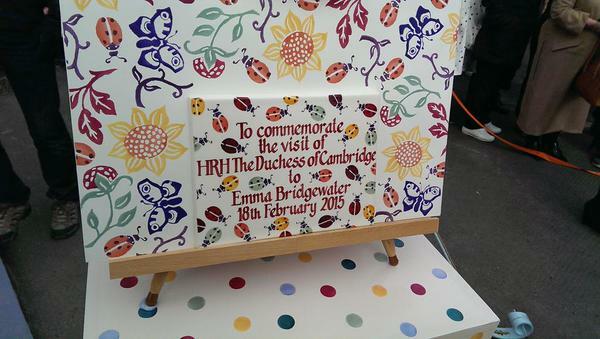 Compelled to post today as I was there in Stoke to welcome Kate as she arrived at Emma Bridgewater! Such an exciting day to actually see her in person! Unfortunately, due to the entrance of the factory being on a main road we were not able to get close enough to kate for her to 'walk about'. My little girl was disappointed as she was not able to give her the bunch of roses we had bought (although we did get a lovely smile and a wave as she went by in the car). We saw her step from the car, she is so beautiful, tall and slim (super slim for 7 months pregnant). She turned and waved to us again as we shouted 'good morning Kate' across to her! The photograph you have above Charlotte, when kate is greeted by the uniformed gentleman, between the two of them and blurred in the background is me and my friend! My claim to fame! She then turned and waved across to us which was caught by the photographer in the next picture. All in all a very exciting morning. The local newspaper (this is staffordshire-sentinel) have more photographs of kate leaving Stoke, her helicopter landed and took off from the local Park. Just wish we could have been a bit closer to her. Ah well, there's always a next time! Teachermum: How exciting for you and your little girl and thank you so much for sharing! I enjoyed reading the post above from "teachermum"" who was there to see Kate today. She looked lovely today and well-rested. I might go as far as to say she looked the best I have seen her look in some time. The colors work really well on her and she looks genuinely happy and interested in all of her charity work. It is really wonderful to see. arlotte for doing such a great job and keeping us informed. I check your blog daily for updates! I second all of that -- my immediate thought was that she looked rested and happy. Thank you for your warm welcome ladies, it is lovely to finally 'join in'! I've thought about kate a lot today. I'm always looking out for her next appearance, and if I'm honest, my main interest is in her fashion. But after seeing her today and watching the news clips of how she interacts with the people involved in her charities I feel a little ashamed. She looked so beautiful and happy today in person. I'm going to try to stop looking at the close ups of her fashion, she is under scrutiny. I get up, throw some clothes on, brush my hair and that's it, out the door! She has to contend with being one of the most photographed women in the world and everyone's opinions that comes with that. Not sure what I'm trying to say here. Just felt sorry for her when I saw in the Daily Mail that they had circled the patches of grey hair in a photograph taken today. This really is so rude! Thank you Charlotte for this amazing blog. It is the first place I check, daily, for new stories aboutKate. Not "trying to say", Sarah...you *said* it. And very well in my opinion. :) I'm sure Kate would appreciate your kindness. As for the DM's emphasis on her hair...unfortunate, to say the least! YES! the video had same effect on me - love her more; appreciate what she does and how she cares; and puts people of all walks at ease. I would love to meet her! I think I get what you're saying, Sarah. I've had a similar thought myself. Kate appears to be a very personable, warm, and engaging lady and that doesn't get noticed as much as what she's wearing. Even when she went to that Scout meeting in a hoodie and jeans everyone's focus was "the DUCHESS is wearing a HOODED SWEATSHIRT and JEANS(!!!)." The kids and parents she interacts with will hardly remember what she wore but will remember always the words of comfort/support she spoke to them. You're right! She did pull her hair back more. I noticed the fly aways and thought it must be humid or something but then looking back when she arrived versus the other photos she has pulled more hair back out of her face! Interesting for sure. I wonder if the hair wrapped around the Pony tail fell out and she had to redo it. Maybe just behind her ears? Wow, good catch! She did pull more back, and tucked it under the original ponytail. We don't have humidity in February. Oh yeah, she pulled more back. It's so interesting reading the different views of Kate's fashion choices. Some of you think her choices are boring. I think her choices are calculated and careful. I also think she seeks advice from those who are close to her. If you are an American (and I am one) you might not know about a very vocal group of anti-monarchists who wish to do away with all royals. I think it's only about 30% of the population but they do make a loud noise and I believe it's growing. If Kate became a "style icon" it would only add more fuel to the fire because photographers love her! I think her choices are tastefully spot on without Kate being labeled a "fashionista" by the anti-royals. Kate probably doesn't read the Daily Mail, but I'm sure those people around her do. Other members of the royal family make far more public appearances, but we seldom get to see any photos. It's doesn't seem fair, but that's the way it is. Thank you Charlotte! She looks lovely love her hair and coat! The dress does nothing for me though. What a wonderful post Charlotte! I've had internet and wifi issues the past couple weeks and for some reason I could pull up and read the blog, but could not post. All the comments posted by other readers wouldn't show either. Technology...blah. I'm hopeful this will post! Back to the day..... Kate looked lovely and cheerful! The blue coat was so pretty! Another great one to add to her collection! I always like Kate's hair pulled partially back off her face. She looked so pretty! She seemed to genuinely enjoy her time with the children and families, as she always does. She looked very happy and I'm sure brought an abundance of joy to those who met her today. She is definitely in her element with the children. I loved the little girl walking over for a high five. Too cute! While I love to watch Kate's fashion choices, I really love seeing her interact with others on her engagements. I've said it before, but I truly believe William found a rare gem with Kate. She's confident and classy, yet warm, embracing, and down to earth. A difficult position being one of the most watched women on earth. I know she brings great awareness to her charities and will no doubt help in the funds being raised for the new facilities in Norfolk. I REALLY love the pottery by Emma Bridgewater! I have not clicked on the link above, but Charlotte do you know if it is available to us in the US? If so, is the shipping and enormous amount? Also, is the pattern with proceeds going to EACH sold in stores or only online? Thinking if it's sold in stores, I can wait to get it this summer. Lots of questions...sorry. Thanks for the wonderful post again and VERY thankful to be able to post comments again! Hope you are doing well! Enjoy the rest of your weekend! I love watching the video - she looks so happy, and so naturally lovely -laughing, almost giggling, at her jokes and making everyone else at ease = the pottery throwing so gorgeous - she is a natural and I would love to buy a mug, just asked my London based brother if he would get me one and bring to Australia for me one day! Lovely lovely collaboration. I love the pottery!!! Theresa, QLD, Australia battering down for a cyclone tomorrow. And I have not commented on Kate's hairstyle so far, but perhaps it was a little "severe" pulled back as she had it. I do love her with a chignon, but I don't think it's her style 24/7. But a shorter, more layered look would be flattering and easier to work with. CP Mary's, for example, is very versatile. I thought it was particularly mean off the Daily Mail this morning to highlight Kate's grey roots on the front page! Poor Woman! I understand that it is advised not to colour hair whilst pregnant, so she is only doing the best for her unborn child, which makes the headline all the more unkind. I am sure I am not alone in thinking this! I agree. BUT, I think it works out for the best for them. All comment's I've seen on Twitter and such has been supporting of her. She has gotten sympathies for this, and that will help PR-wise. But as a person to see stuff like that must be so annoying! Does anyone think that maybe Kate did her own hair and didn't realize that any grey was showing and then when she got to the engagement it was pointed out by Rebecca Deacon or someone close to her so it was fixed and more hair was pulled back? Or else maybe she's just used to having more hair pulled back and the hair around her ears was bothering her... Anyways, Kate looked gorgeous as usual! I was totally grey at the age of 19. I have to admit that I am not a fan of Catherine per se because in the beginning she didn't come across as a woman of substance at her age. Her work shy history didn't impress me (and neither did the Queen), followed by her MM moments with her clothes, and so on. However, after three years, Catherine finally appeared "put together" (in my humble opinion) with her hair out of the way, a few quality engagements for PR sake, and being engaged with the people around her without rolling her eyes or making comments such as "William hates me in blue ...." That sort of thing. (Or at least it was not reported.) Somehow it does appear she is now listening to her handlers (and new PR guy they hired). I do like the overall look, etc. She did well. Now -- if she could say a few words during her engagements like Sophie, Countess of Wessex (who does it very well), then it would be one step forward in the right direction. Thank you for an incredibly lovely and timely post as always, Charlotte. I thought HRH looked well and rested as others have commented. Becca USA I thought your comments about the late POW and HRH were very interesting indeed. I once heard the Prince of Wales in an interview in the 80s say how he liked his wife well turned out (not doubt the influence of HM The (late) Queen Mother) and I often wonder if, as with most things HRH does,one component of her sartorial choices is she is pleasing HRH The Duke, just as the late POW was trying to please The Prince? His beloved grandmother famously said barely forty years before Charles married Diana that when she appeared in all her finery and jewels during the Blitz how she was sure the people whom she met were doing the same for her. I do think a bit boring is a lot more dignified than MMs, and at the end of the day what is most important is HRH shows up with a smile for everyone and genuine interest. I really believe the late POW ad a special touch with people as well, but it was a different time and we did dress very differently (much less casually) then; protocol has relaxed even more substantially from 1981 to 2015 than it did from 1941 to 1981 as well; in addition, as everyone has mentioned, there is a difference between Duchess of Cambridge and Princess of Wales. I loved the Jaegar (apologies to your mother Charlotte) and although I don't care much for the dress today, the overall look was brilliant, and her hair lovely. What is really important to me is that HRH exudes caring, just as the late POW did. All that being my opinion, I also so hope HRH will pick it up a bit on the jewelry when she becomes POW (hopefully she will be very much older before that event occurs). I think more of Kate's hair was pinned back because she was warned that she would be near machinery in the pottery. And of course, she was going to be with children as well, and her hair falls forward when she gets down to their level. Someone did a nice job of adapting her hair style. Her shoes had also been cleaned of the dust from the gravel once she was indoors. Perhaps her personal assistant was with her. I still think it's likely that all the short hairs one sees when Kate is photographed in sunshine are the result of HD. She probably had hair loss, and the pregnancy hormones are causing regrowth. I think the short hairs also could just be because she obviously puts a lot of chemicals into her hair and gets it done/treated quite a bit. She probably also has it straightened, since her natural hair seems to be more curly. Add all of that up, especially to the level that she gets her hair done, and major hair loss/damage is to be expected. It could definitely be because of the HG, but I think her hair treatments are probably a larger cause. Overall, though, Kate's hair looks beautiful and healthy. Hair is born all the time. Everyone ha hair ov every lenght at every moment, only some times it is more obvious than others. The Court Circular on line has again omitted these engagements--makes six of her engagements since January omitted. Really?! This crap is going on this year too? Sigh... they had a huuuuge problem with the CC the full last year as well. That's just sloppy!! How is it even possible?? The year just started.. that's bordering suspicious. I read that so far this year about 10 days is missing with about 90 engagements not there. That is just wrong! Hope none of you are insinuating a conspiracy. These numbers are over ALL the working royals. VERY interesting...... Jean, any thoughts on why this is happening? What do you think, if Kate will be March 17 Day St. Patrick? I think that will be the last or one of the last her engagement before she takes maternity leave. I kind of don't think so. I believe she will stop 'working' before then. Sadly it may be the first year not handing out Shamrocks. I think with George she took maternity leave about 1.5 months before and will likely do the same again. But it all depends on when she is due. I think so too, if she does another. The first St. Patricks Day presentation was one of my favorite looks of all time on her. That coat was gorgeous. Maybe 1½ before he was born. But remember he was born late. Meaning it was about 1 month before the due date. That is why my guess is if the due date is early april she won't go but if it is late april she will. I read that Kate will not be doing any engagements while William is in Japan & China. It said she did not want to take away from his work. I think it is a great choice. We all know that Kate can't even go to get coffee without someone taking a photo of her. And this well be William's first extended trip without Kate by his side. He went to Malta but that was like just over night. So I would think George will be missing his daddy so I think it is a ggod idea if Kate stays close to him. Bluhare, YOU'RE BACK! Yea! I hope she does the St. Patrick's Day engagement. If so, I think it will definitely be her last. George was "tardy" (as William said), so who knows when this little one will decided to make his/her debut. I agree with Rebecca that Kate will stop engagements around a month prior to her due date. How sweet is my brothers girlfriend - I am a Kiwi living in Australia and really wanted a ladybird cup to support this charity, and to link me to the Duchess - I tongue in cheek asked my kiwi brother and his English girlfriend living in London to order me one and bring it to this side of the world when I see them one day, years away possibly! Anyway, she has placed an order for me and picks it up soon - I am very excited and shoes how global Kate's charity work can go! Sweet lady. Thanks for the blog! I thought the coat was lovely--the color, the cut, the collar, the soft wool. I, too, wonder where in the world she keeps all her coats? They must take up a whole room in the palace! And how do she and her assistant get organized about which coats she takes to Anmer for a long stay? When my daughter was moving between two locales in the course of a job change, what she needed for a certain occasion always seemed to be in the other place! P.S. I have to have one (or two!) of the Bridgewater pink vases. Are they included in the charity campaign? Lynn, I have always wondered the same thing....where are all the coats kept?!?! I would love to see Kate's closet and how items are kept and organized. It must be amazing! I suppose I'm so late with this comment that nobody will see it, but I'll say it anyway: I loved her look for this outing! The coat, the dress, her hair, the shoes, the clutch. Everything looked classy together, everything worked well and contributed beautifully to her being totally engaged in the people and the causes she is championing here. Kudos to her for the work she's doing. And as always, kudos to you too, Charlotte, for your continued excellent work on this blog! Nice outfit, for someone twice her age. ^^just a random (maybe true) article about Kate and William's Anmer Hall housekeeper and gardener quitting.